The research fraud of STAP cells papers published in “Nature” has become a serious social problem in Japan. The RIKEN Center for Developmental Biology the lead author Haruko Obokata belongs to decided her participation in the verification experiment to prove the existence of STAP cells, without enough investigation of research was fraud. Even though fraud has been already confirmed in the papers, Japanese Government money is still being used in verification experiments for STAP cells, whose existence was even denied in gene analysis, and animals are being sacrificed even today. Furthermore, as a result of questioning RIKEN, we discovered that there were irregularities in the procedure of conducting animal experiments in the STAP cell research. Due to that fact, we are sending the following protest letter to RIKEN. We have sent twice a letter of inquiry to your Institute, asking about the violation of the “Fundamental Guidelines for Proper Conduct of Animal Experiments and Related Activities in Academic Research Institutions” (hereinafter, GUIDELINES) under the jurisdiction of the Ministry of Education, Culture, Sports, Science and Technology, and the “Regulations on Animal Experimentation” (hereinafter, REGULATIONS) of RIKEN, that were violated in the STAP cell research conducted at RIKEN Center for Developmental Biology, (hereinafter, RIKEN CDB). After receiving your answer, it has been confirmed that there was a period where Dr. Haruko Obokata tested on animals in state of violation of the GUIDELINES and REGULATIONS, and it makes clear that your Institute has problems in its posture for the examination of Animal Experiments. For this reason, we are sending this document in order to protest strongly against the verification experiment of STAP cells that have been carried out at RIKEN CDB. As for the STAP cells, the verification experiment is still being given priority, even though the whole content of the scientific fraud has not been investigated neither published, and this is causing a great distrust to your Institute. We, as an Animal Rights/Welfare Group and as national citizens, have suspicions and demand an investigation. 1. We protest strongly against the participation of Dr. Haruko Obokata in the verification experiment. In addition, we request a STOP on animal testing done by Dr. Yoshiki Sasai, until a disciplinary action has been decided. Dr. Yoshiki Sasai, Deputy Director of RIKEN CDB, forgot since April 2013 to register Dr. Haruko Obokata as an animal experiment worker, and although a correction notice was submitted retroactively, we were told that the examination results were pending. Forgetting to submit the Animal Experiment Worker Application we think was the fault of Dr. Sasai, but it means that Dr. Obokata has tested on animals violating the GUIDELINES and REGULATIONS, and at the moment there is no punishment or penalty imposed upon it. It seems that Dr. Sasai thinks that it is enough applying retroactively, but if things are handled that way, the very significance of the animals testing regulations of the country and the institution guidelines signification will be lost. 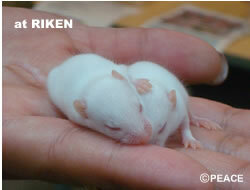 First of all, the animal testing-related organizations of the Japanese Association of Laboratory Animal Facilities of National University Corporations that RIKEN CDB is joined to, argues that the “authority management of animal experiments are performed properly.” They have been reiterating until now that laws and regulations are not necessary, as the belonging organization will take disciplinary actions if improper conduct is found. However, if things are accepted as Dr. Sasai says, without imposing any penalty for this, those allegations come to be false. The fact that allowing Dr. Haruko Obokata, who has been testing animals in a state of violation, to participate in the verification experiment without a disciplinary action imposed, demonstrates the lack of ethics of your Institute. We protest strongly against the participation of Dr. Haruko Obokata in the verification experiment. For GUIDELINES/REGULATIONS violations, we request a punishment be given even for Dr. Sasai, and until then, we demand a STOP on animal experiments. 2. We demand a STOP on the verification experiment of STAP cells itself. In the spring of 2011, when Dr. Obokata began the STAP cells research at RIKEN CDB, the animal experiment plan was not submitted for the research purpose of “Cell initialization subjecting the cell to stress”, and the approval for the animal experiment for this purpose was obtained late in October of that year. According to the answer to the question on this point, your Institute seems to think that there is no problem since Teruhiko Wakayama, the team leader at that time, registered Dr. Obokata in an animal experiment plan of a research for other purposes. However, the examination of the animal experiment plan is done in order to compare if “the animal suffering” is commensurate with “the purpose of the study”. In other words, an examination of “if the research is to be carried out over the pain of animals, even at the cost of life” is performed, and it is supposed that the mechanism to perform animal experiments is constructed ONLY after being approved; however, in spite of this, this was not the case in the STAP cells research. In the Nature papers, it was written that it had passed the ethical review of RIKEN CDB, but taking the time into consideration, it can be said that this is false. Now that the STAP papers have lost its basis due to scientific analysis, many scientists and people involved in science journalism have doubts about the verification experiment. However, we consider not only that point, but strongly protest against the implementation of the verification experiment, because this has been an inappropriate research since the beginning. We feel a strong concern for the structure of the Ethical Committee for Laboratory Animal Experimentation of RIKEN CDB, that allows the STAP cells research being initiated on the basis of violation of GUIDELINES and REGULATIONS. Since the replication of an experiment that has lost its basis is being approved, it is doubtful that the examination has been done properly. At this moment, the whole picture of the research fraud is not yet clear, and it means that it has not been determined who is involved in the fraud. If STAP cells were ES cells or a mix of TS cells with ES cells, naturally there will be much speculation about their origin. In such a situation, it is impossible to believe in RIKEN CDB, even if it insists that it is a fair experiment. Animal sacrifice must not be permitted for a verification experiment that does not make sense scientifically and its ethical procedures are questionable. We demand a halt not only on the participation of Dr. Obokata but also the implementation of the experiment itself. 3. Please thoroughly investigate the whole picture of the research fraud. The investigation made by the Investigation Committee of RIKEN was very poor, limited only to six points of the questions about the papers. Currently, it is said that a research of whether or not to perform an investigation again is being carried out, but the investigation range is not clear and it is unknown when it will start, making the distrust worse. If the investigation is limited again to a few points of the papers, public discontent will reach a limit. We demand an extensive investigation, including the investigation of the background, to be able to know why fraud occurred. Today, from the analysis results, the belief that STAP cells are ES cells has strengthened. The words of Dr. Wakayama, “these (STAP stem cells) are not from the mice I passed” in response to the result of the analysis that were asked to a third party, are of serious social concern, but please, investigate not only the origin of the cells but also and especially the whereabouts of the mice Dr. Wakayama passed to Dr. Obokata. If ES cells were falsely passed as STAP cells, there is the possibility that these mice were not used to produce STAP, and we have a strong concern from the point of view of experimental animal ethics on how they were disposed. We demand an investigation into how Dr. Obokata disposed of the mice. In fact, it is not clear to what extent Dr. Obokata really conducted animal experiments. In the teratoma experiment, where incorrect images were found, there is no record of purchase of immunodeficient mice (as in the papers we obtained by information disclosure request), and the probability of them not being made is high. We demand a comprehensive study, not only of the experiment notebook, but also of whether there is evidence that the experiment was really carried out, comparing with the record of the use of animal rooms and the purchase of mice. * We have requested an investigation into the purchase of goods done even after the investigation of research fraud began. Although so many animals have already been sacrificed in the world trying to reproduce STAP cells, something that is scientifically baseless, I hope you will respond immediately so as not to have a repeat of such serious mistakes.